What is the ideal target stand for yield and profit? 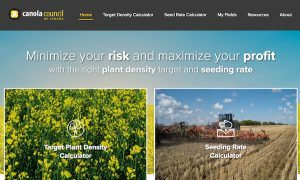 The other half of the calculator – the target density calculator – considers risk tolerance and risk factors to set an individualized target stand in plants per square foot. With this target, users can go back to the seed rate calculator and enter seed size, target stand and estimated seed survival to reach the required seeding rate. The calculator defaults to 60% seed survival, which is fairly typical for Western Canada. If you do better than 60% survival, enter your own expected percentage. Want to learn how to improve your seed survival? Read this. Did you achieve your target stand? Use calendar reminders in your phone to set a date in late May or early June to “count plants”. These counts will indicate your true survival rate. If the stand does not match your target, try to figure out why. It could be cool soils, disease, insects, frost … any number of factors. Knowing your emergence percentage will help you identify opportunities for improvement in your harvest (residue management), seeding (timing, depth, seeding rate, seed-placed fertilizer) and crop protection practices.